Toronto is now the 4th largest city in North America, Fly there and then head for the countryside surrounding Toronto for some enjoyable and challenging golf. When most people think about a golf trip they rarely think about Canada but my weeklong trip here gives me a new perspective on that. You have access to one of the worlds great cosmopolitan cities and some beautiful countryside and wonderful golf courses nearby. Today we played Angus Glen. Three days later Angus Glen hosted the Pan Am Games golf tournament. Did you know that golf is now a sport in both the Pan Am Games and the Olympics? This was its first year and it was a success. In 2002 and 2007 The South Course hosted the Canadian Open which was renovated earlier 2015 to the tune of $6 million. There are 36 holes here (North and South) and South is the where the tournaments are played and a championship course it is. If you are a beginning golfer, this may not be the place for you as there are many places to loose balls in the water, fescue, (lots of which was added in the renovation) wetlands ponds and streams. But if you love a challenging walk in nature this may be exactly the place for you. Canadian Tire Motorsport Park—- If you love motor racing, then you don’t want to pass up a visit here. This 2.5 mile track hosts many auto and motorcycle races including Formula 1,Indy Car, Stock Car. They also offer lapping days and driving schools with professional drivers for those who want to experience this for themselves. Nestleton Waters Inn. Tucked away in the countryside of Nestelton Ontario, just about 50 minutes east of downtown Toronto sits this charming B&B. It sits on 93 acres of forest and a spring fed pond. There are 7 very individually decorated rooms (two are 2 bedroom suites. Mine was the Mapenzi suite decorated in an African theme. Our hosts, the Kiezebrink family, built the entire B&B and they did an outstanding job and truly make you feel like its your own home. We stayed in some wonderful hotels on this trip but this place is very special. How does a golf club get a Royal designation? In the UK it happens by a decree of a royal family member. In this case the club made an application to the Govt. of Canada and got one from them. (It didn’t hurt that Prince Andrew had been there.) This club is in Whitby Ontario just 45 minutes from the center of Toronto. We spent some time with the owner, Wilson Paterson, a life member in the Canadian Golf Hall of Fame. He told us about the course and the many rounds of golf he played with Moe Norman, right here on this golf course. For those of you who have never heard of Moe Norman, he is widely regarded as the greatest ball striker in history. An old set of Moe’s clubs is on display in the clubhouse and the worn spot on each iron is the size of a dime and right in the center of each clubface. Royal Ashburn is a beautiful parkland course with ponds and streams on eight of the holes. Five sets of tees gives every level of player a challenge from 7104 yards down to 4783. Greens fees are $85-$92 (weekdays or weekends) plus a cart. Founded in 1921 (they are 94 years old this year) Bay of Quinte Golf & Country Club is a true value in southern Ontario. Par 73 and playing only 6571 yards from the tips and down to 5063 from the reds. This place is a real value at $44 and $52 on weekends (plus cart if you want to ride). These greens were in outstanding shape and running at least 11 on the stimpmeter. There is water in play on nearly half the holes but its all easy to navigate. Three of the four par 3’s are long for such a short course. but that makes for some short and attackable par 4 holes. There are several interesting holes and number 14 is a perfect example. It plays 262 from the tips and is drivable for big hitters, but if you are even 20 yards short, you are in trouble— so its best to lay up to 100 yards or be sure to stay to the right where there is a very welcoming, yet narrow strip of fairway. Come play here and have a meal in the clubhouse and enjoy the view over the shore of Lake Ontario. Black Bear Ridge may be the best golf value in the area. It sits on a beautiful piece of property with wonderful views from its many elevation changes. It opened in 2005 and was designed by its owner Brian Mcgee. There are not many golf courses designed by non professional golf course architects but this is one and its magnificent. I call them “one and done.” Routing a golf course is such a challenge that few people can do it successfully, especially with no training. This is a story in itself. The first tee sits on top of a hill overlooking the fairway 100 feet below and there are several holes with similarly dramatic views from their tee boxes like 7,10 and 17. Number 8 may be a short hole (300 yards or less depending on which tees you play) but don't let that fool you. It is a sweeping dogleg right with a large pond guarding the entire right side. If you are not paying full attention to this beautiful place then # 11 will stop you in your tracks. It was originally designed as a par 6 (that's not a typo) at 692 yards from the tips (it must be over 690 yards to qualify as a par 6) They shortened it by 2 yards because almost no one ever played the very longest tee box) so it is now a legal par 5, sweeping around a 600 acre migratory nesting ground. Par 5 Number 18 heads back up hill to the clubhouse with stunning cross bunkering and colorful fescue framing the green at the top of the hill. With all its streams, ponds and treelined fairways this will be a breathtaking course in the peak of fall colors. Sits on the shore of Lake Simcoe an hour north of Toronto and has been in the Sibbald family since 1876. Its still family run, and guests stay in either the historic manor house or adjacent cottages. It has old world charm that wont quit— even to the point that they still use old style room keys. Miles of hiking trails, a world class spa all at a beautiful lakeside resort. 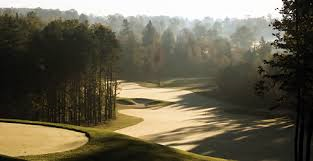 TheBriar’s golf resort right next door has been a secret in the Toronto area but its soon to be a secret no more. It was originally a nine hole layout designed but Canada’s premier golf course architect, Stanley Thompson in 1922. Fifty years later Robbie Robinson, a former protege of Thompson, added the back nine. If someone didn’t tell you they were built 50 years apart you would never know because both nines wind seamlessly and breathtakingly through the trees , ponds and streams narrowing into velvety slick greens. Its short at 6285 from the tips but mighty. If you refuse to leave your driver in the bag on several of these holes, you may regret it. Briar’s is private, but the Briar’s resort has stay and play packages, so it’s the only way on for the general public, on this former farm. On #14 still stands an old grain silo as a memory of that farm and it seems that everyone stops to take a photo of it. Definitely worth it, is all I can say. I hope to return here to play again one day. Lora Bay Golf Club is located about an hour north of Toronto. This golf club was designed by Tom Lehman and Thomas McBroom. It sits right on the shore of Georgian Bay, of Lake Huron with a spectacular new clubhouse. The back nine has some especially interesting holes. Just behind the green on number 11 sits a century old barn. #14, a short par 4, that some call “The temptress” is a mere 328 yards from the tips with plenty of trouble in the landing area so choose your club at the tee carefully. Then comes the signature hole number 15 par three that drops over 200 feet below to the forest floor, but as you enjoy the spectacular panoramic view of Georgian Bay. remember you cant stay there forever, you still have 3 holes to go. The par 5, 16th has you hitting to an elevated fairway. This hole has only one bunker and no water but there is more challenge here than you can imagine. Caledon Country Club is a really fun par 72, 6502 golf course from the tips. It has lots of elevation changes and it makes for a fun day. The holes even have catchy names such as #3 Devils Corridor, #5 The Chute, #7 Slipery Slope, #9 Go For Broke #12 The Prayer #14 The Signature and #15 Alcatraz. That alone should clearly define this quirky little course. Just how challenging can a par 71 golf course be with one water hazard in play (maybe 2), not one single sand trap and playing 6358 yards from the tips? The answer is much harder than you think. Hockley Vallley has so much elevation change that they had to get gas carts because the battery powered carts couldn’t hold enough charge to make it 18 holes. This amount of elevation change also makes it almost impossible to walk. The greens are small and most sit in an amphitheatre. They look beautiful and at first glance would appear to gather your ball back down to the green, however if your approach gets more than 8 or 10 feet off the green, you are likely to have a near impossible chip. Finding a level lie after you leave the tee box on this golf course may be a challenge in itself. I know I said there are no sand bunkers but there are more than enough grass bunkers to make up for it. And the funky lies these produce probably make for harder shots than any fluffy lie in a sandtrap. That certainly isnt definitive. Do you know of one? #10 has a 100’ drop to the fairway and #17 has a drop from the tee box to the fairway of over 120’ and there are many more with similar views. Hitting shots from these tee boxes will have hang time that would make an NFL punter proud. If you don’t like heights this may not be the place for you. Wooden Sticks, designed by Ron Garl, has twelve out of eighteen holes that are “inspired by” holes from Augusta National, St. Andrews, Sawgrass, Pine Valey and Troon. They are not intended to be exact replicas, but when you step onto the tee box of these holes you will certainly recognize them The other 6 holes really make the course worth the full day visit. Most guest stays here are 6-7 hours and each round includes 2 full meals from the restaurant menu. Many use their stay and play packages as they have 6 cottages on property. We went fishing on Lake Ontario and even challenged ourselves to a ropes course. The golf here is wonderful but there is certainly lots more to do. Come to Canada while the exchange rate is favorable. I was recently a guest on the podcast KEEP YOUR DAYDREAM talking about my quest to play the top 100 golf courses in America.